Mike Trout is the best player in baseball. But who is second-best? Harper? Kershaw? Bryant? Machado? Donaldson? There are lots of great players to choose from. Like most baseball fans, we at The Comeback have little uncertainty about who is the best player in baseball. It’s Mike Trout, the two-time AL MVP and five-time AL WAR champion. But after Trout, the rankings get murky. We got to thinking, if Trout is the undisputed best player in baseball, who’s second? Ian Casselberry: I’m still having second thoughts over my answer for last week, so will make up for it now. The second-best player in MLB is Bryce Harper. Maybe his struggles last year (.243 average, .814 OPS) should be taken into consideration, but that’s part of what makes him second-best. Mike Trout may be the only other player who can surpass Harper’s combination of hitting, power, defense and speed. It’d be nice to see him run more, but Trout isn’t tearing up the basepaths like he used to either. It surely isn’t a coincidence that the Washington Nationals have the best record in the National League with Harper rebounding and putting up MVP-caliber numbers. Ryan Zimmerman’s totals might be a bit more impressive right now in a resurgent season that no one likely saw coming. But Harper and his astounding .496 on-base percentage makes that batting order go. Defensive metrics say he’s just above average in right field currently, but how many others at his position can unleash an accurate rocket like he did Wednesday night against the Orioles? Matt Clapp: This is maybe the most difficult roundtable we’ve had yet, as there are so many options you could go with here and make a great argument. Clayton Kershaw, Bryce Harper, Kris Bryant, Manny Machado, Corey Seager, Francisco Lindor… you could say any of these players and not be “wrong,” in my opinion. And I’m going to make an argument for a guy you don’t hear about nearly enough in such discussions: Josh Donaldson. That’s pretty damn eye-opening. Yes, Donaldson is 31, and could hit a decline at any moment. Maybe that’s this year. But over the last three years, he’s been the clear second-most valuable position player in baseball, and he’s put up at least a 6.6 WAR for four straight seasons. Until he starts showing otherwise, Donaldson should be viewed (at least) as highly as any player in baseball not named Mike Trout. Alex Putterman: For some reason, these conversations often wind up centered on position players, but that’s not really fair. Pitchers are baseball players too, and any conversation about the game’s best has to include Clayton Kershaw. The three-time NL Cy Young winner has a nearly impossible 2.08 ERA over the past six-plus seasons. He’s on track to finish his career as one of the best pitchers ever and with a 2.40 ERA in seven starts this season, it’s clear he’s still got it after a back injury last year. He’s the only in-his-prime player other than Trout who consistently puts up numbers befitting an all-time great. Joe Lucia: My answer could change by next week. But right now, I would go with Bryce Harper. He’s healthy, he’s in a groove, and he looks like the 2015 NL MVP again. When he’s playing like that, he’s one of the best players I’ve ever seen. Brandon Liebhaber: I’m going with Clayton Kershaw. As a Los Angeles native, I might be a bit biased. Especially considering I’m picking a pitcher here. But similar to the year in which Kershaw won the MVP, there just isn’t another position player that stands out. Bryce Harper is awfully close, but Kershaw is the one current player that has performed as consistently well as Mike Trout over an extended period of time. It’s crazy that his numbers through Thursday (2.40 ERA, 53 K/7 BB, 168 ERA+, 0.925 WHIP) are somehow underwhelming, but that is the standard he has set. He has been worth at least 4.0 bWAR each of the past seven years. As a pitcher. We’re so used to seeing the Dodgers in the playoffs every season, but with how flimsy the rotation has often been behind him it’s not hard to pin him as the main reason they’ve been so successful of late. And he manages to do this every year, even if he misses some time due to injury. It seems like most pitchers aren’t able to maintain elite stuff as well as Kershaw has, and he’s been the best of the bunch. Remember Jake Arrieta? The 2015 Cy Young Award Winner has a 5.35 ERA at the moment. When it seems like most guys come and go, Clayton Kershaw is always there. Deesha Thosar: My pick: Clayton Kershaw. The Dodgers’ ace has a career 2.37 ERA, a 4.07 SO/BB and a 2.57 FIP. That’s 10 consecutive years of consistency. And in a league where offense gets all the paparazzi, without Kershaw’s caliber, the Dodgers aren’t up for contention. 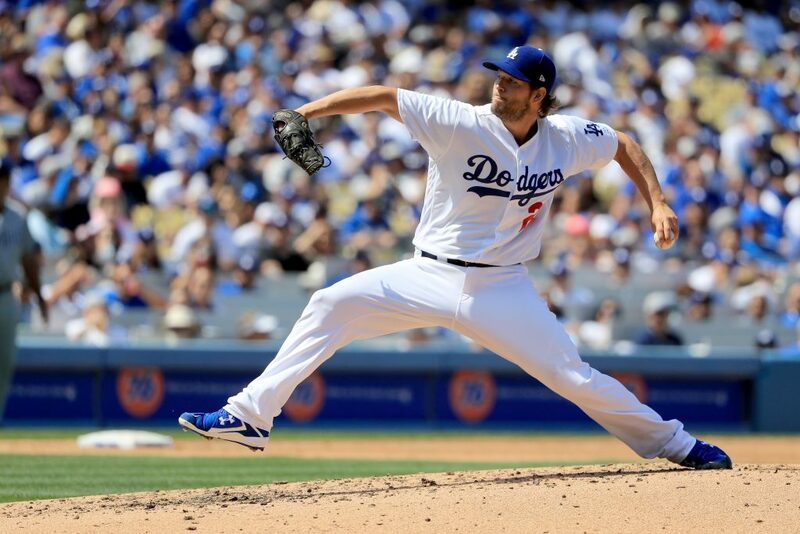 Out of Kershaw’s seven outings this season, six are quality starts. He’s fanned at least seven batters in five out of seven games. He remains fantasy baseball’s No. 1 starting pitcher. He’s tied for first in MLB for most wins (5). The Dodgers’ ability to reach the postseason in six of Kershaw’s nine years with the franchise isn’t happenstance. And beyond that, pitchers in the league are being led by the high standard of Clayton Kershaw. Liam McGuire: It’s got to be Clayton Kershaw. In three of the past five seasons, he’s had an ERA below 2, while posting absurd strikeout rates. Nobody makes opposing batters look as silly as Kershaw. The left-hander is not only the best pitcher in baseball, but he’s among the best players period. After Mike Trout, no single player makes as much of an individual impact than Kershaw — even if he only takes the mound 30+ times a season.